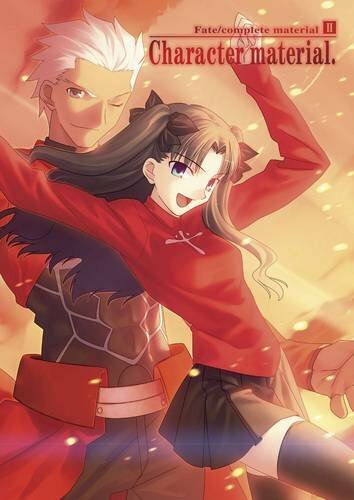 Here's the second artbook for Fate/Stay Night. The first artbook was released in 2014 and covered cutscenes, visual effects and promotional art. This artbook focuses on character design and weapons. It's a really thick book at 256-pages. The content is split into coloured illustrations and sketches of the characters and weapons. For the character designs, there are artworks of different poses and facial expressions. The accompanying text are profiles and also artist interviews that talk about the designs and the characters' roles in the story. There are a lot of characters so there's a lot of interesting info you can pick up. The coloured illustrations are those from the video games so you may have seen them online already, just that they are collected conveniently here. The included sketches consist of rough designs in the early stages. There are also some storyboards too, in pencil sketches. If you're a fan of the Fate franchise and want to know everything about the characters and weapons, then this is the book to get. The print, paper and binding quality is similar to other Udon artbooks. Since this book is so thick, it's prone to getting creases if you open the book too wide. So be careful there.